The Quinnipiac Bobcats (4-13 overall, 3-1 Metro Atlantic Athletic Conference) continued their home court success after defeating the Rider Broncos (6-9 overall, 1-3 MAAC). The Bobcats overcame the Broncos in four sets (25-23, 25-14, 22-25, 27-25), improving their MAAC record to 3-1. The first set between the Bobcats and the Broncos never saw more than a three-point lead for either team. However, a couple of kills by junior Jen Coffey gave the Bobcats a 25-23 edge over the Broncos. An explosive Bobcat offense capitalized on Bronco mistakes in the second set, winning 25-14. For a team that had previously been worried about their offense, the Bobcats racked up a total of 62 kills on the day. After jumping to a quick 2-0 lead, Quinnipiac fell short in the third match. Missed serving opportunities came back to haunt the Bobcats later in this set. The height of the Broncos’ team was able to shut down Quinnipiac 15 times in this competition. Having a total of nine players on the Bronco roster listed as over six feet tall, the height advantage was definitely in favor of Rider. Entering the fourth set, the Bobcats jumped out to an early four-point lead. However, this lead diminished after key outside hitter Jen Coffey was taken out of the game with what appeared to be an ankle injury. The removal of Coffey from the game seemed to rattle the Bobcats. However, they overcame the struggle as other players stepped up in Coffey’s place. After a neck-and-neck battle between the conference rivals all throughout the fourth set, the Bobcats powered to a 27-25 win with the help of the exceptional offense by Elizabeth Kloos. Kloos had 20 kills and four aces on the day. 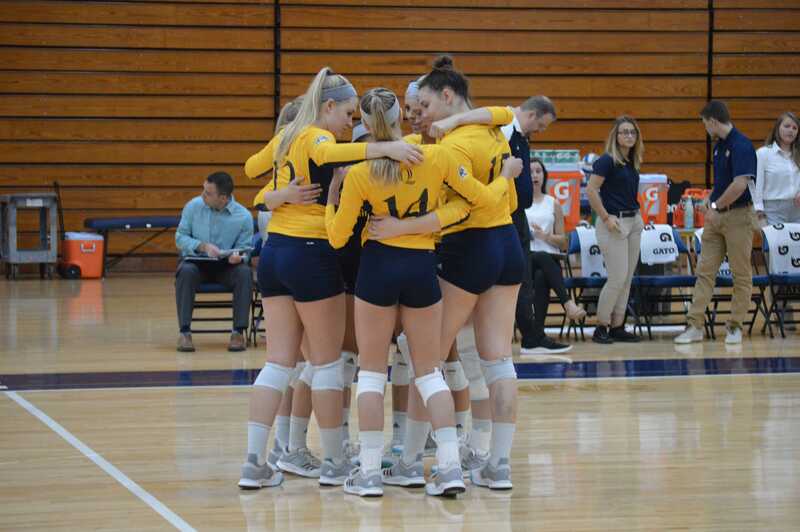 “For the whole preseason, playing tougher teams and then finally coming back to the MAAC play, this is exactly what we were hoping for,” Kloos said. Quinnipiac’s win extends their home record to 2-0 on the season. The Bobcats look to continue their win streak as they take on Siena College (0-14 overall, 0-3 MAAC) on Wednesday Sept. 27 at 7 p.m. at the Burt Kahn Court.